Villa Almendro est l'un des quatre villas Villas solaire. Situé au sommet de Plaza Solar, situé au centre de Santa Teresa, vous pouvez voir la route paresseuse de la ville depuis votre balcon, ou échapper à la terrasse arrière parmi les arbres Almendro. Nous sommes à seulement 3 min à pied de la plage eh avec les meilleures vagues dans la région pour surfer de loin. Aussi une promenade proche du supermarché et de nombreux restaurants. Villa Almendro partage les jardins et le parking des autres villas, avec un rancho commun pour se détendre. Nous offrons des services de conciergerie et un gardien sur place pour la sécurité et la commodité. Venez vous détendre dans notre villa entièrement équipée à seulement quelques pas de la plus belle plage du Costa Rica. Greg the owner, took a deep and sincere interest in ensuring our stay at his villa was great! Right from the beginning Greg shared his cell number and encouraged us to let him know of our needs and questions. He is an excellent communicator and responds to every query promptly, honestly and clearly by phone, WhatsApp email or text. The villa met our expectations. The best part was having breakfast on the lovely deck looking at the forest while listening to the howler monkeys and tropical birds. During the dry season the main road in Santa teresa is dirty and dusty! The back veranda faces the hills -not the road, and was perfect. The ac works well and together with the ceiling fans we were kept perfectly cool. Greg ensured that the cleaning staff came twice during our week and cleaned properly. The beaches in Santa Teresa are among the most beautiful in the world. At our request, Greg found a beach chair for us. Greg was correct in saying that many of the hotels will let you use their pool, hammocks and chairs if you buy a drink or meal at their restaurant. We found that to be the case at the lovely Tropico Latino located a 1/2 mile down the beach. Groups of dogs roam around Santa teresa but over all the town is safe. Greg takes safety seriously by securing the property and guest vehicles with a high fence and gate. A friendly caretaker resides on the property and is available to take care of anything should it arise. Greg was extremely conscientious and hospitable and really made our stay at the villa wonderful. 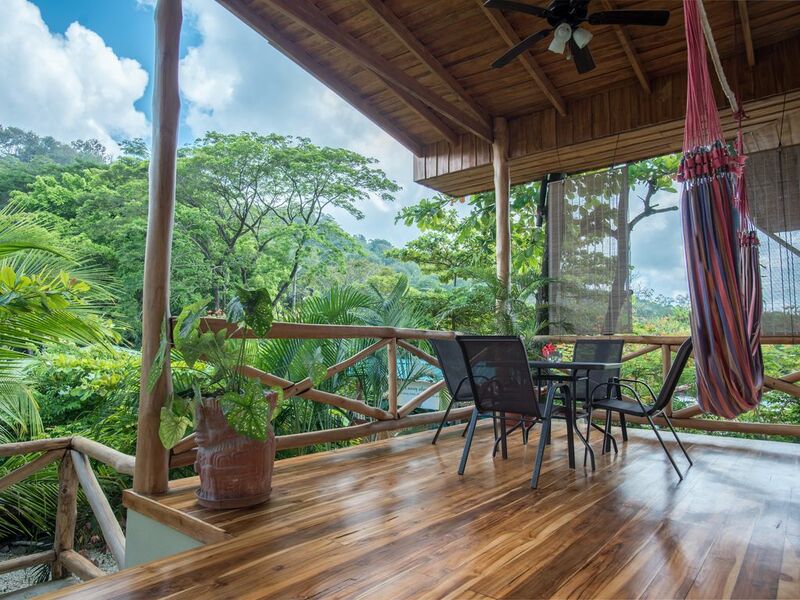 Amazing Santa Teresa Costa Rica vacation villa that you will love! Looking for a quite , safe/secure ,comfortable, beautiful villa in the heart of Costa Rica - look no further. This villa has all the modern conveniences , includes outdoor living and is an easy 3 minute walk to a beautiful beach. Watching amazing sunsets at the beach will be your new tradition . Also, shopping, restaurants , grocery store are just around the corner from your home. The owner Greg is very helpful and kind. Be prepared to love this vacation get away. Enjoy! We stayed over samana santa with two adults; two kids and a dog! We had a great time. The condo was a great size and super close to everything. We walked everywhere - beach, shops, burger places! Greg was super helpful and had lots of dinner suggestions! Villa Almendro (part of Villas Solar) is a great place. Greg and his staff are super nice and helpful. The apartment is super cute, very clean and secure. Also a plus it is very close to the beach! We ate out as we were only here for 2 nights but there is a fully equipped kitchen for meals and a well priced market close by. We would definitely stay here again if we come back to Playa Santa Teresa! Two couples traveling together and we can't say enough about this wonderful Villa. When we arrived and Greg was there to meet us. After a quick tour we were on our way to the beach to catch our first sunset. Greg and staff were very helpful with all kinds of ideas for our stay! The apartment was very clean and walking distance to stores, restaurants and the beach was right across the street! The area was very safe and secure! We will return again for sure!